As Shadowhunters ushers in two new showrunners for its second season, there are a lot questions surrounding how the show will play out in the hands of Todd Slavkin and Darren Swimmer. The first thing you have to understand is that bringing in two new showrunners with unique visions that differ from former showrunner Ed Decter means that Shadowhunters is essentially being rebooted. And that might not actually be a bad thing. 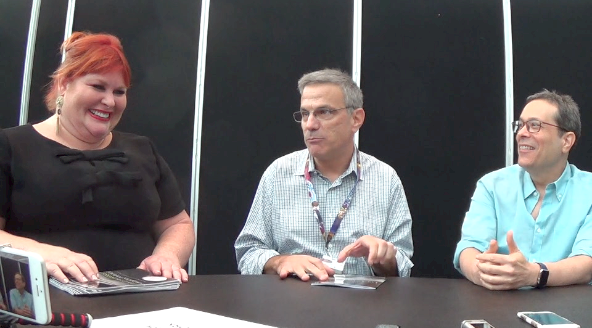 We had the opportunity to chat with Slavkin and Swimmer, along with Cassandra Clare, at New York Comic Con about some of the hot topics surrounding the fandom. Of course the focus on Slavkin and Swimmer centers around transitioning between showrunners and remaining faithful to the story. Hailing from Smallville, Slavkin and Swimmer understand that the characters are the ones that should drive the story, not the plot or action. “The word ‘ship’ to me doesn’t mean sexual,” Slavkin said. That’s absolutely right. A “ship” is basically two characters that you enjoy watching interact and share an emotional connection. And while more often than not it tends to be of romantic implications, ships aren’t always romantic. Watch the full interview below where the showrunners discuss Sizzy and Saphael, integrating scenes from the books, the passionate fandom, and more. Clearly these guys have no time for season one and are all about returning to the books. I begin to have a glimmer of hope. Reboot time. Thanks for the interview 🙂 I caught that he said “season 2a” which makes me rather happy to hear because that means they are likely to run eps 1-10 from Jan-March and run 11-20 in the spring/summer so we have Shadowhunters throughout the year. Here’s to hoping that’s the case! Love what they’re saying about Season 2 ~ sounds like a return to the character development and complexity of the relationships in the books. Lots of mention of Magnus and Rafael, being immortal, hinting at having history – wonderful! Really looking forward to what they’ll do!